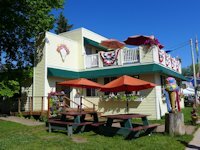 On a Memorial Day Weekend we took the Grand Tour of the islands offered by Apostle Islands Cruise Service. 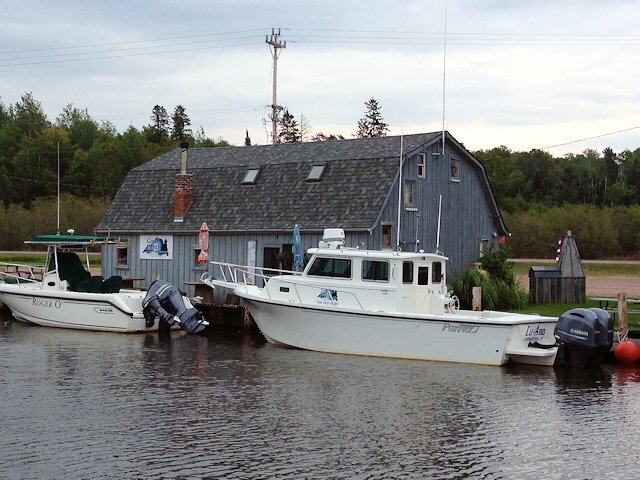 Early in the season, this cruise departs at 10 am and returns to Bayfield at 1 pm. 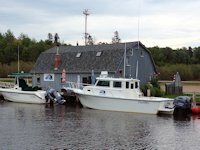 Later in the season, they also offer afternoon and evening cruises as well as specialty cruises focusing on various aspects like lighthouses, sunken ships, island land tours, etc. We traveled on the "Island Princess" which will carry up to 140 passengers, with a maximum of 50 on the upper deck. < < < The upper deck passengers were bundled up for the cool air and the morning breeze. The first 50 tickets purchased have the option of seating in the upper deck. 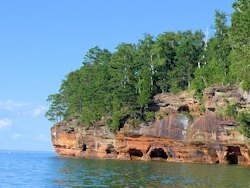 < < < Honeymoon Rock at the north end of Basswood Island. 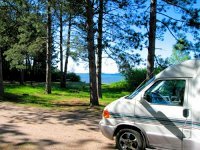 < < < Oak Island in the background, the second largest of the Apostle Islands. < < < A group of sea kayakers paddle their way to Raspberry Island. 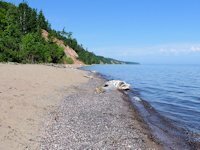 Apostle Island Kayaking is a popular recreational activity. A few years later the repairs to the lighthouse and grounds were finished and we took a cruise to the island and the Park Service's special Apostle Island Raspberry Island Lighthouse Tour (go here for photos and information on the tour). 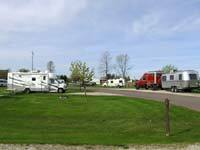 Apostle Islands tours and water taxi service (for island campers) are also operated out of Cornucopia, Wisconsin by Good Earth Outfitters (see our link on the Cornie page). 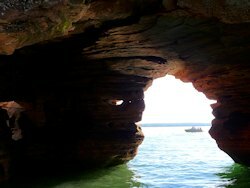 See photos from our 2016 Mainland Bayfield Sea Caves Boat Tour.